The Scarlett Letter is a 17th-century romance novel written by Nathaniel Hawthorne. The novel is based on the life of Hester Prynne who bears a child out of wedlock after having an affair. During that era, society had strict standards concerning women who conceived children outside of a conventional marriage. As a result, she suffered embarrassment, shame and ridicule. Hester found it difficult to rebuild her life because of the stigma that had now been attached to her. In June 1642, a young woman Hester Prynne is found guilty of adultery by the people of the town she calls home in Boston. A crowd gathers to witness how she receives the punishment for her sin. She is required to wear a scarlet A on her dress henceforth and she must stand on the scaffold for three hours where she is exposed to public humiliation. She is pregnant but refuses to name her child’s father (who is dying of guilt). Just when she is being shamed, Hester’s long-lost husband returns and stands in the crowd. He asks and is told of what had happened. Choosing a new name for himself, he vows to find the man responsible and make him pay. Now called, Roger Chillingworth, Hester’s husband had sent her ahead to America but had not arrived for a long time. He was assumed dead till his return. By taking a new name and a new practice of medicine, no one is able to recognise only reveals himself to Hester. He swears her to secrecy. As the years go by, Hester works as a seamstress to support herself and her daughter Pearl both of whom are shunned by the community and live in a small cottage on the outskirts of Boston. The child is unusually unruly. The community officials want to separate the child from the mother but a minister, Arthur Dimmesdale intervenes. The young minister, however, is not well. He is suffering from a mysterious heart problem that is causing him psychological issues. Chillingworth is the one treating the minister and eventually moves into his house so as to provide medical care around the clock. The doctor is suspicious of the existence of a connection between Dimmesdale illness and Hester’s secret. One day as the minister sleeps, the doctor discovers a mark on the minister’s breast. Dimmesdale continues to inflict tortures on himself as punishment for his sins as Chillingworth continues to torment him. One night as Perl and her mum is returning from a deathbed visit, they find Dimmesdale standing on top of the town Scaffold. The three join hands and Pearl ask her father to acknowledge her publically on the next day. He refuses as a meteor draws a symbolic red 'A' on the sky. Hester and Dimmesdale arrange an encounter in the forest where she tells him that Chillingworth is actually her husband and they resolve to flee to Europe where they can live as a family with their child. The ship taking them there is to leave in four days and Hester finally removes her scarlet letter. She also lets her hair down but the problem is that Pearl does not recognise her without the scarlet letter. A day before the planned trip, Dimmesdale gives an eloquent sermon to the townspeople as they gather for a holiday. Meanwhile, Chillingworth has learned of the planned escape and booked a passing on the same ship. As Dimmesdale leaves the church, he mounts onto the town scaffold together with Hester and Pearl. He publically confesses that he is the girl’s father and exposes a scarlet letter seared in his chest. He then falls and dies and his daughter kisses him. Chillingworth is left frustrated with his revenge and dies a year later. Hester and Pearl leave Boston without a word. Years later, Hester returns home alone wearing the scarlet letter. She lives in her old cottage and resumes her charitable works. Pearl, who is now married to a European aristocrat, occasionally writes to her mother. Eventually, Hester dies and is buried the same tombstone as Dimmesdale. The tomb is marked with a scarlet letter 'A'. A young woman who is sent to the colonies by her husband, Hester Prynne is the main character and protagonist in the story of The Scarlet Letter. Upon arriving in the town of Boston, the young woman waits for her husband only for him not to arrive as expected and is presumed dead. Hester then gets into an affair with the town’s minister, only to become pregnant and has to face the consequences of her actions. She is forced to wear a scarlet letter 'A’ on top of her dresses as a sign of her sin as an adulterer. She gives birth to her daughter Pearl and struggles to become a strong single mother. She accepts her sin but cannot understand why her punishment has to be so severe. She questions the society at large. She, however, takes her sins and uses the punishment given to her to get inner peace. This is Hester’s husband who is an aged scholar come medicine man. He arrives on the day when Hester is publically shamed for her sin. His heart is filled with bitterness as he strives to make whoever made his wife pregnant pay for the sin. He is a symbol of evil. When his revenge mission is disrupted by the sudden death of the culprit (Arthur Dimmesdale) he dies soon. Arthur Dimmesdale is a young minister of God’s word who is eloquent and wise. When Hester gets to Boston, he starts a secret affair with her which results in the birth of their daughter Pearl. When Hester’s sin is known, she refuses to tell him. He also does not speak up. Instead, the guilt builds up in his heart. He decides to punish himself by whipping himself every day. But still, the heaviness will not go away. This is made worse by Roger Chillingworth who keeps tormenting him on the issue after the medicine man discovers the truth. This guilt causes him to be sick and eventually kills him. At the end of the book, he reveals his sin before he dies in front of the whole town in Hester’s hands. He is a symbol of the secret sinner who will not acknowledge his sin till he has anything left to lose. She is the child born of the love between Hester Prynne and Arthur Dimmesdale. She is considered to be the product of their sin. She grows up to be a smart and beautiful girl. She notices that Dimmesdale is her father even if anyone else does not. She is a wild child too. This can be attributed to the fact that she grows up isolated from the rest of the town and has no one to learn things from. She particularly has a very weird mode of play. This character is an actual historical figure representing Richard Bellingham who was first elected as governor of Boston in 1641. He was a respected leader who witnessed the heavy punishment placed in Hester. He believes that Hester should not raise Pearl as the child would not grow well spiritually. He, however, eases his decision after Dimmesdale pleads on behalf of the mother and child. This is the sister to Governor Bellingham and is also a witch. She is portrayed as being ugly and bitter-tempered. She sneaks into the woods at night to do the works of the black man (the devil) and hold itch parties. She is a notorious character. Like her brother, she was also a real person who was executed in 1656 for being a witch. The scarlet letter has been around for a long time and persons still continued. Despite the fact that some may call it boring you have a lot of raving fans out there who call it a masterpiece and shows the artistry of one man’s literature which is Nathaniel Hawthorne who is the self-proclaimed author of the novel. It’s amazing how persons are still passionate about such a novel that is written so long ago. If you are a fan this novel or are about to read it. Here are 7 topics that would really help you to think deeply about this interesting and probably cause a heated discussion among your friends who are equally passionate about it. Does the portrayal of governor general Bellingham who was running things at the time correctly represents US governments in that era? In your essay or discussion show the connection of the US government being a bit too aristocratic. In the novel from a lot of persons view point Chillingworth a known protagonist appears a bit too protective by the author. Do you think Hawthorne has really done any justice to him? Give a brief discussion on the heated relationship between Hester and pearl? Give your viewpoints on the fact that Hester knew pearl had an unlawful child in that period and still fall for her. What is the main story behind this novel? Some persons see it as revengeful because in the novel Chillingworth seeks revenge and got it and then he fall under it. What is your main takeaway story-wise from the novel, where do you think the author was taking his characters? What would change story wise if you were the author? What is your view on pearl’s whole character in the novel, Do you think she is a bit arrogant? Elaborate your view on pearl and discuss the main moments in the novel that backs up your point. Do you think the way Shillingworth goes about his revenge was moral or it could’ve done way better in terms of justice? Overall what is the main lesson you get from the story that could be applied in your life? Do you think the effect of sin on the characters and society was a wide theme that was littered throughout this novel or the idea of romance was better portrayed? All these questions will help you get a better understanding of this amazing novel written by Nathaniel Hawthorne. If you are adventurous enough, it would be interesting to read the old English side of this novel at a library or see if you could get it somewhere online because it would help you to get a better understanding of Nathaniel Hawthorne’s literature and writing. It might be hard to read but it has helped a lot of persons to really get into the author’s and understand thoroughly how persons used to write and think in those time. Nothing is wrong with the newer versions but the old English ones are very interesting. An affair as passionate as the colour scarlet. In “The Scarlet Letter” by Nathaniel Hawthorne, the story opens to Hester Prynne - a young woman in seventeenth-century Boston being led with her infant daughter, Pearl, in her arms from a town prison. An adulterous accused, Hester, who has been forced to clothe herself in scarlet – with the letter 'A' on her breast as a sign and mark of her shame and indiscretion. Remaining unidentified, her lover, Arther Dimmesdale, is torn with guilt. While waiting for her husband, Hester entered into an affair with Dimmesdale. She then conceived a child, Pearl, as a result. Her husband, Roger Chillingworth seeks revenge. Is Hester feeling remorse over the crime she committed? Hester only feels regret for the effects of her crime and that of the consequences they had brought upon her child. As well as her position in society. However, she feels strongly that the greatest crime is Chillingworth's betrayal of Dimmesdale. In the end, Hester learns self-forgiveness while Dimmesdale is unable to. Why is it that Dimmesdale intervenes on behalf of Pearl when Governor Bellingham orders her removal from the care of Hester? There are two possibilities for this scenario. Either Dimmesdale wants Hester to raise Pearl and strongly believes that Hester deserves to care for her – seeing that he is connected to Pearl emotionally by being her father. The other possibility could be the fact the Dimmesdale indeed fears that Hester may reveal his name. In the end, it seems as though the greatest motivation for his decision is guilt - as when Hester looked at him with 'imploring eyes' then only did he decided to come to her defence. How has the view on Adultery changed from the Puritan society and today's society? What is the difference and where does the blame truly lie? In today’s modern society Adultery is viewed as, a break or breach of a marriage contract which was entered into by two individuals. For this reason, it is seen as a private matter. However, in Puritan society, the matter of adultery was not seen as a private one. It was seen as a both a breach of contract between two people as well as between the community in their residing location. How is Pearl embodied as the Scarlet Letter? Pearl, in all her relentless, unrepressed and wild passion portrays and represents the adulterous passions of her mother and father – just as a scarlet letter. She is a constant reminder of her parent's illicit and passionate affair. In her society, Pearl is completely out of place. What is the reason for Dimmesdale constantly placing his hand over his heart? Curious, Pearl constantly poses this question to Hester, but her mother refuses to answer her. Further on it is revealed that Dimmesdale has both literally and figuratively inscribed a scarlet letter of his own into his flesh right above his own heart. He has done this to in the hopes of being able to identify and commune with the same guilt, shame and public excommunication that Hester had endured. Are there community members who feel that the punishment Hester received for her adultery is either too light or too severe? Initially, they believed the punishment she received was much too lenient. Some had even suggested branding her with a hot iron. Others advocated the death sentence which was associated with biblical standards as well as the New England statutes for that time. Thankfully, over time they do seem to loosen their attitudes towards Hester's indiscretion – however, not a much as Hester would have liked. Others who have acknowledged their on weakness and sinfulness has less likely to judge her and feel that the community could possibly lessen the punishment. Is Hester or Dimmesdale grieved with greater guilt? Although Hester has (over time) come to terms with her sin, Dimmesdale feels strongly that he has sinned according to his own system of beliefs - being the town minister. Holding such a position Dimmesdale feels he has violated his own morals and values which he upheld for so long. He fell into the very same sin which he had stood against for decades. The guilt he feels he takes to heart and it causes him great suffering. Other than Hester, what do Dimmesdale and Chillingworth possibly share? Having very prominent roles in society, both men conceal their involvement and relationships to the indiscretion, leaving Hester as the only party to take the blame and public responsibility for it. Both men maintain their roles but are ultimately destroyed through their secrecy and their entanglement in a relationship which becomes of a parasitic nature. Does Chilingsworth ever decide to forgive Hester? Although it seems as if Chillingworth has forgiven Hester however, his rage has been directed towards Dimmesdale. Chillingworth has come to the realisation that he should have never married a woman who was and would never love him. For allowing Hester to indulge in her passion with Dimmesdale she must be punished. Towards the end of the novel, it is noted that he decided to leave his estate to Pearl. In doing so it seems as though his (Chillingworth’s) sinister acts are somewhat ameliorated.
" The Puritan colony founders found it necessary to build a cemetery and a prison in every society they formed. Despite their projection of the society being a Utopia of the human virtue of happiness and virtues, they still recognized this as their basic necessity. " The Puritans believed that perfect kind of living includes living by virtue and happiness. However, the first thing that they built in their town was a cemetery and a prison. The prison was the place where they put the people who committed inevitable mistakes while the cemetery was a place to lay their bodies to rest. This quote means that no matter how perfect the leaders want their society to be, there will always be forces that they cannot control, and they have to look for alternatives.
" Hester came, not as a guest, but as a necessary inmate, into the household that was full of trouble; just as a blessing in disguise, she got an opportunity to interact freely with her fellow human beings. " The quote shows that Hester Prynne has decided to use the chance that she has to make the best out of it. Her contribution to the society has prevented others from the pain and misery that she may have experienced.
" One form of embarrassment would not be so much helpful in hiding another one. " This quotation in the second chapter of the Scarlet Letter shows that as much as Hester strives to cover her scars, at the back of her mind she still remembers about it and she will always live with it. Additionally, it means that as much as Hester’s child was a good thing that came from her adultery, the society will never fail to see the mistake that she did.
" “Be silent dear little dear little Pearl!” … “We must avoid speaking to others in the market about what happens in the woods.” "
This quote is meant to make Pearl get silent about the family intentions to flee the area and not tell her mother’s secret to anyone. It also aims at keeping what happens in the forest back in the woods without revealing it to the people for scrutiny.
" A clean hand does not need to be covered in a glove. " The literal meaning of the quote is that if the hand is clean, then there should be no importance wearing a glove to hide the impurities. It means that Dimmesdale who has committed so many sins has used religion to cover up all of them. The glove symbolises the religion. There are several themes explored throughout the book including legalism, sin and guilt. 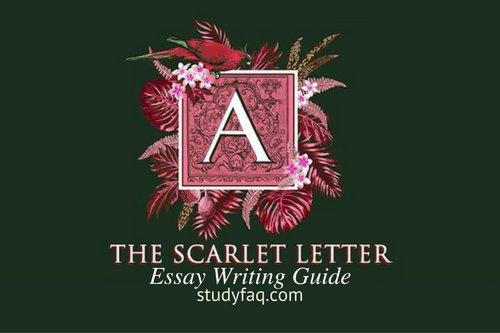 If you are struggling to find questions to write an essay here are some examples of the Scarlett Letter essay questions. Do Hester's actions show that she is genuinely sorry and regretful for the crime that she committed? Or is there another motive behind her penitence? Describe the relationship between Pearl and Dimmesdale. Why does he get involved on her behalf after Governor Bellingham removes her from Hester's care? What are some of the main differences between the ways adultery is viewed by modern day society as opposed to the way in which it was viewed by Puritan society? How is the Scarlett Letter embodied by Pearl? : Dimmesdale is renowned for placing his hand over his heart, is there a reason why he does this? What is the opinion of the community regarding the punishment administered to Hester for adultery? Do they view it as too lenient or too harsh? What is the purpose of the open house essay at the beginning of the novel? Out of Hester and Dimmesdale, who feels the most guilty and why? Chillingworth and Chester have one main thing in common and that is Hester, do they have anything else in common? The prison door is often discussed in the novel, what does it represent? : How does Hawthorne portray the Puritanical society? Pearl is represented in a certain way throughout the novel. Discuss the similarities between Hester, the protagonist of the novel and Hawthorne. Kathryn Harrison makes a statement that in modern American literature, Hester can be seen as the first great heroine. Do you agree or disagree? Rodger Chillingworth has a very distinct character. Describe what he represents in terms of the range of different themes that are present throughout the novel. Why does Hester continuously refuse to stop wearing the letter? What is the relationship between Hester's identity and the Scarlet Letter? What are the main differences between the identity that society has assigned to Hester and the identity that she has created for herself? Describe ways in which the Scarlett Letter can be read as an American history commentary of that era? The novel contains several symbols, discuss the main difference between the way the Puritans use symbols and the way the narrator uses symbols. What is the relationship between the events in the book, and the locations in which the events in the book take place? Would you describe the Scarlet Letter as a protofeminist novel? If Hester had been a man would she have received the same punishment as she did as a woman? Discuss the way in which Hawthorne sets the mood by using the setting in chapter 1.